Curious what’s going on behind the numbers? Quantifind’s SIGNUM for Restaurants filters and correlates consumer conversation to the KPIs that matter most – restaurant sales numbers. Panera’s push to remove all artificial ingredients from its food continues to enhance its popularity among healthy consumers. Looking only at the conversations that drive revenue, we see that the approach is working especially well in the generally health-conscious Pacific U.S. Relative to Q2, Q3 metrics are up significantly with buyers from the West Coast when it comes to voicing positive emotions, positive food tastes, dating meet-ups, and wish-fulfillment. In other words, Panera customers on the West Coast were more excited about the food in Q3 than they were in Q2. 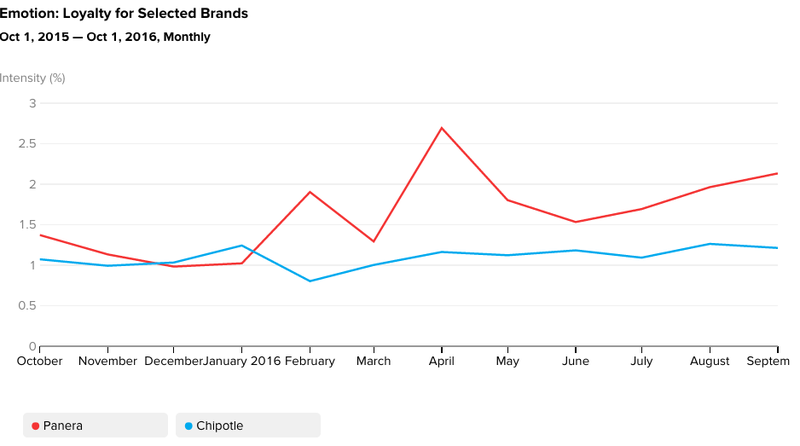 Additionally, Panera gobbled up some of the market share lost by Chipotle in the wake of the E.coli scandals that first hit in November 2015. Quantifind data shows that Panera brought in more than twice its fair share of the revenue leaking from Chipotle – a bounty bigger than that of McDonalds, relative to their sizes. Here you can see Chipotle’s loyalty scores amongst all buyers dip as the scandals start to mount, while Panera’s take off. But the news isn’t all great. The biggest challenge for Panera continues to center around its delivery program. Earlier in the year the company announced plans to expand delivery services into 122 company-owned cafes and 73 franchised cafes by the end of 2016. Yet this uneven distribution caused some confusion with its own consumers. Some lament the lack of delivery where perhaps it’s available, while others ask why their local Panera doesn’t deliver. The common words and clusters typed by Panera customers during Q3 on the delivery topic are negative. Phrases like “not deliver” and “wish” and “found out” appear the most often. There’s clearly an opportunity with this audience hungry for delivery; perhaps Panera can capitalize on it in Q4 and beyond. Want to know who’s driving your revenue, and how to drive more? Quantifind can illuminate your competitive blindspots and show you how to steal market share.